When we keep life simple it is surprising how good our lives can feel. Happiness is not complicated, it was never meant to be. Sometimes you just want to switch off. The truth is you will feel better if you do. Advertisements make us feel worse. Ultimately the director is trying to make us feel positive about a product we could not care less about and eventually purchase it. We panic about not having the right car,life,home or health insurance……the list goes on. We feel we are not participating unless we are purchasing. Our leaders ask us to stop saving money and get the country back on track by ………shopping! Our thinking , societies thinking and those that lead us do nothing to create the lives that we deserve. Oil companies in The U.S receive subsidies of $4 billion a year and McDonald’s costs that American Taxpayer $1.2 Billion annually because workers are not paid enough to support themselves. They serve food that contributes to a nations ill-health. Yet the media nag govt get excited when a fast food chain announces 100 new jobs, yet we never get to look beyond the real cost to our society. It doesn’t make sense. We are thinking completely the wrong way. Opting out to live a simpler life allows us to create a less stressed world. Not always an easy thing to do! This Summer I took 5 weeks off and travelled across Spain on the beautiful Camino. I made a conscious effort to disconnect as much as I possibly could. No Emails, no phone conversations about 5 in total. No newspapers no news, no Tv = no worries. I didn’t have any idea what was happening in world news or my home country’s news and guess what…. it didn’t matter. I connected with people every day. We talked , we supported each other ,we laughed, we broke bread together and we perfected the skill of being able to stay in the moment. We carried our essentials in our backpacks so we had no luxuries. Shower gel and shampoo were luxuries rarely found. Nothing else mattered each day but the yellow arrows that guided us to our destination and the wonderful awareness of each step. The masks came off and it was just our t-shirts, shorts and boots, your afternoon shower was the cleanest you would be for 24 hours. Yet it is in these simple actions that we are happiest. No longer bombarded by tv or media but completely aware of ourselves and those around us and experiencing what everything…. your past…. your future is made from……. a series of Nows. Wake Up! Turn off the world once in a while and spend time in silence away from the manufactured complications of this world. 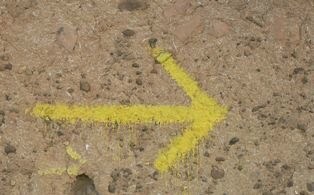 As the yellow arrows that guide you along the Camino( the Way) signify a simplicity in moving forward. It is by welcoming this simplicity to that you will embrace moving forward. Thankyou to my fellow travellers who made my journey so much easier and wonderful beyond words Netje,Carlo,Amy,An Nie,Doroty, Jerry,Kazuyuki, Raimon, Denise, Becky,Martin, Rory and Raquel… there is a special place in my heart for all of you.